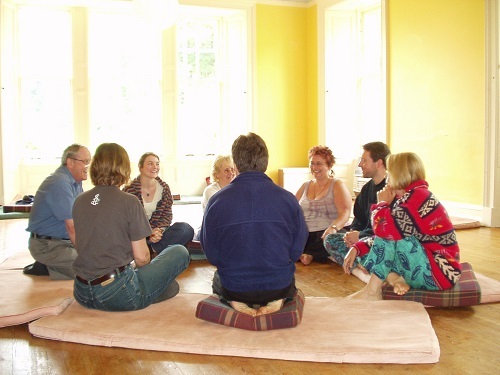 I have been co-counselling since 1991, and I have taught a number of CCI Core Training courses in the Leeds and Bradford area, usually one a year since 2001. Within the local and international CCI network I have facilitated many workshops on a variety of topics (eg death, loss, choosing+being chosen, rejection, men’s groups, eating and feeding, here-and-now processes, psychodrama, unfinished family issues, creating community and using masks). …is a BA in European Studies, for which I studied French and German. When I got interested in therapy in my mid-thirties, I first did an introductory course, followed by an RSA Certificate in Counselling Skills, at the Swarthmore Centre in Leeds. I then trained at Park Lane College and Leeds Metropolitan University and gained a Diploma/BSc degree in therapeutic counselling. I also have a certificate in therapeutic group-work from Group Analysis North. …export sales and then in the music industry, I started counselling in late 1992. I have worked at Burley Counselling Service, often with people referred by their GP, at Leeds Metropolitan University as a Student Counsellor, as a Divorce and Separation Counsellor. I have also worked in conflict resolution as a mediator for Leeds Family Mediation Service. From June 2001 I worked for two years in the NHS as counsellor in primary care, and I have been working as an independent counsellor/psychotherapist in private practice in Leeds/Bradford since 2001. I spend a few hours each week teaching music: I have 20 years’ experience teaching people professionally to play the guitar. My main style is jazz and blues.